a couple of weekends ago, isaac and i spent a saturday in salt lake! i think i've mentioned this before, but we love salt lake. it's big enough to feel like the city, but it's not too crowded and it's clean! we started off the day by watching the byu vs. utah rugby game (isaac used to play rugby for byu, so he wanted to go support his peeps). if any of you have ever watched rugby before...it's pretty intense. these guys are tough. side note: my first encounter with rugby was last winter when isaac was in california meeting my family. we went to watch byu play st. mary's. so i just sat there absolutely clueless, while isaac was cheering...cheering sounds so feminine, let's say yelling for his bros...is that better? anyways! this st. mary's player got plowed by a byu player right in front of us. he stayed on the ground in child's pose position and his teammates start yelling at him. "get up! get up!" this dude starts puking. "get up! come on!" more puking, gasping for air, curling in a ball. the athletic trainers run onto the field and help him, but does the game stop? no. pshhh. of course not. the show must go on! it was so shocking. i was just a little horrified. okay, back to our weekend in salt lake. we went to the rugby game and didn't take any pictures there because sometimes you just gotta enjoy the moment. so just imagine isaac and i sitting on the grass and watching the game amongst all the intense utah fans. on the way to the game, isaac pointed out a "corner bakery" that was nearby the campus. i gasped and about cried. i love corner bakery. my family used to live in maryland and we would go to corner bakery with my great-grandparents for dinner sometimes. it is a classic sandwich, soup, and salad place. my favorite kind of place. so delicious!! after the game was over, we went to corner bakery for lunch and had the chicken pomodori panini. yum yum yum. i made isaac a corner bakery believer. we didn't take any pictures of our food, because we ate it before the waiter even said "can i get you anything else?" after lunch, we drove into salt lake and rented a tandem bike from slc bicycle company. 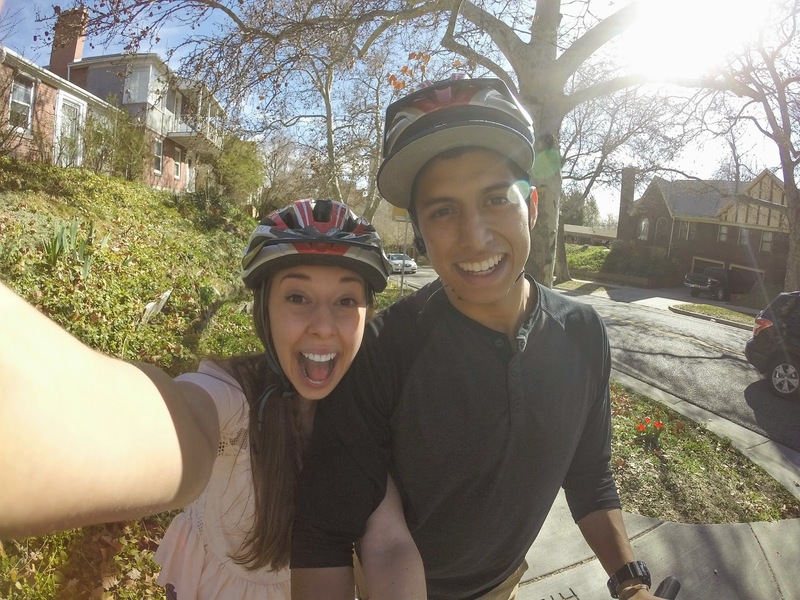 we wore the dorkiest rental helmets and got our instructions because neither of us had ever ridden a tandem bike before. the lady said, if nothing else, remember that the person in the back needs to keep their feet on the pedals when coming to a stop. this is because if the front person takes off without letting the back person know...whack! the back person's shins are toast. eeeek. it was really hard at first to take off and kinda scary because i couldn't really see past isaac. one time he stood up on the pedals and the wheels started to swivel a little bit, and i freaked out! he wasn't allowed to stand up from then on. we rode from the rental place all the way up the hill to the capitol. utah is full of mountains, so it wasn't just a hill, it was a paved mountain! basically. we were panting, it was so tough! but when we made it, the view was beautiful. i had never been up to the capitol before and i really liked it. the cherry blossoms were beautiful! when we were riding back to return the bike, we got a little brave and rode in the street with all the cars. we did pretty well, but i'm sure the drivers were really annoyed! it was so fun. we were singing and yelling the whole way back. and obviously a weekend is not complete without stopping by yogurtland. i get a little emotional if i don't have my weekend froyo. we were too full for dinner, but definitely not too full for yogurtland! You guys are so cute together! I've always wanted to try a tandem bike, but I'm sure my husband would want to try and ride at like 90 miles an hour. ha! Aw what a cute post! love froyo. also love those paninis. they have a copycat recipe online!